Trump’s decision to pull America out of the Paris climate accord is being described by policy experts and scientists as nothing short of catastrophic. In a single day, Trump managed to blunder America into a mistake that will be as disastrously consequential as the Iraq War. And making matters worse, Trump’s speech in the Rose Garden was bursting with lies. When it came down to it, Trump couldn’t even find truthful justifications for why he was doing it – he had to fabricate them. So why did he really do it? A disturbing picture is emerging, but one that is so “on brand” for Trump that it seems not only plausible but probably true. For starters, when Trump kept teasing America with his decision it wasn’t just because he treats his job like a reality TV show, it’s because he is also incompetent and indecisive. This tweet wasn’t just for drama – Trump seriously didn’t know what his decision would be on an agreement that would have an impact on all life on planet earth until a few hours before he announced it to the world. If he needed a nudge, though, one came from France over the weekend. Macron was quoted in a French journal talking about his white-knuckled handshake with Trump at their first meeting in Brussels, where the newly elected French president gripped Trump’s hand tightly and would not let go for six long seconds in a show of alpha-male fortitude….Hearing smack-talk from the Frenchman 31 years his junior irritated and bewildered Trump, aides said.A few days later, Trump got his revenge. Trump has long pegged his identity on something as stupid as a handshake. He yanks, twists, and grips the hands of his victims in an attempt to dominate them. It’s juvenile and pathetic, but unavoidable. 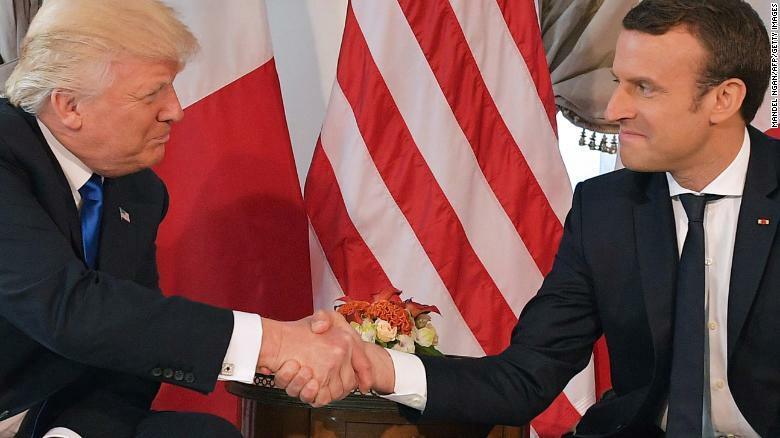 Macron confirmed that he had prepared for Trump’s handshake and went into it with the idea that he would not allow Trump to get away with it. With the tables turned, the awkward handshake went viral. Trump was described as seeking his “revenge” on Macron for the handshake incident by torching the climate deal. Trump’s own comments seem to back this up. In his Rose Garden speech, Trump said he was doing this for “the citizens of Pittsburgh, not Paris” – a not-so-subtle dig at France. The idea that Trump would reduce a crucial decision about the planet’s future to an opportunity to take a dig at a person who had a stronger handshake than him is reprehensible – but largely in line with what observers of Trump’s pettiness have long noted. When ego consumes every inch of your self-worth, you’ll go to great lengths to protect it. Unfortunately for Americans, and that includes “citizens of Pittsburgh,” we are now heading down a path to ruin because of Trump’s need to fuel his narcissism. Author Jameson Parker covers US politics, social justice issues, and other current events which aren't getting the attention they deserve. Feel free to follow or drop him a line on twitter.